Certain moments in our lives forever shape how we tackle the future. 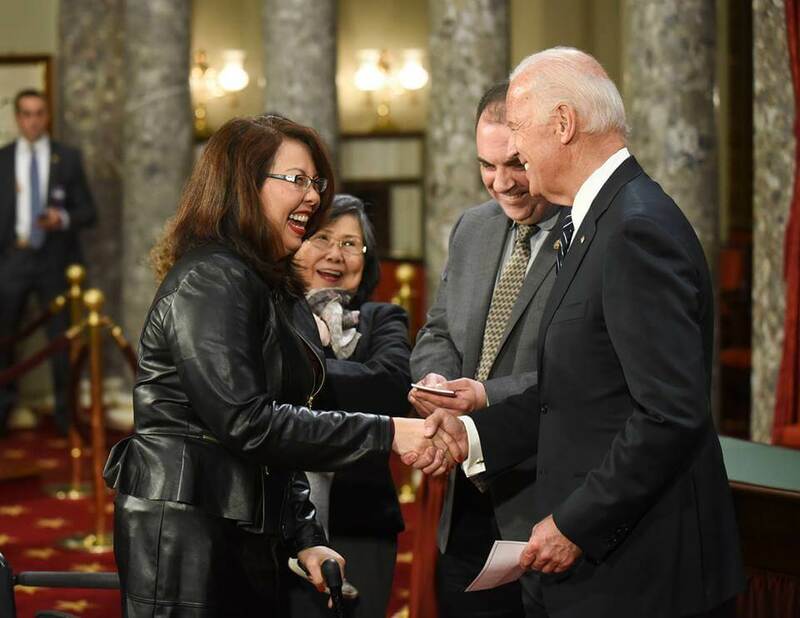 For combat veteran and Purple Heart recipient Tammy Duckworth, that moment happened in 2004. 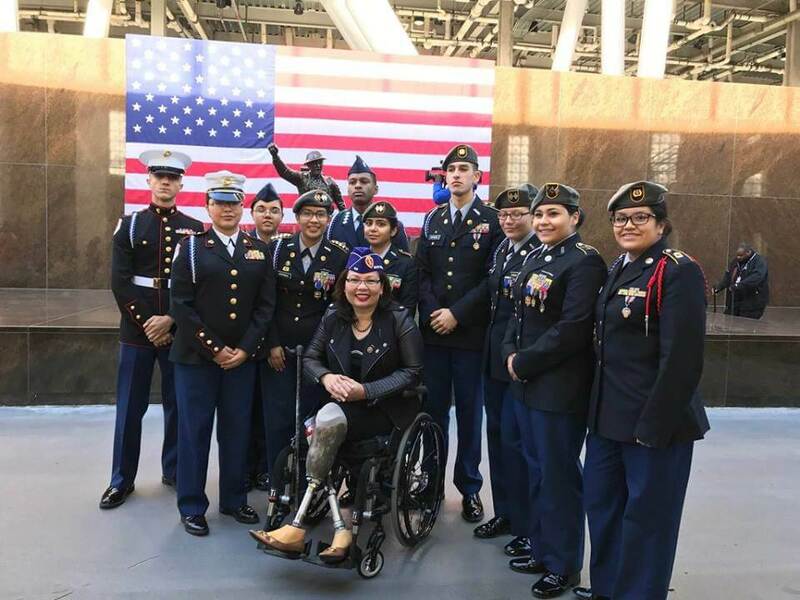 Duckworth deployed to Iraq, where her Blackhawk helicopter was hit by an RPG and she lost both her legs and partial use of her right arm. 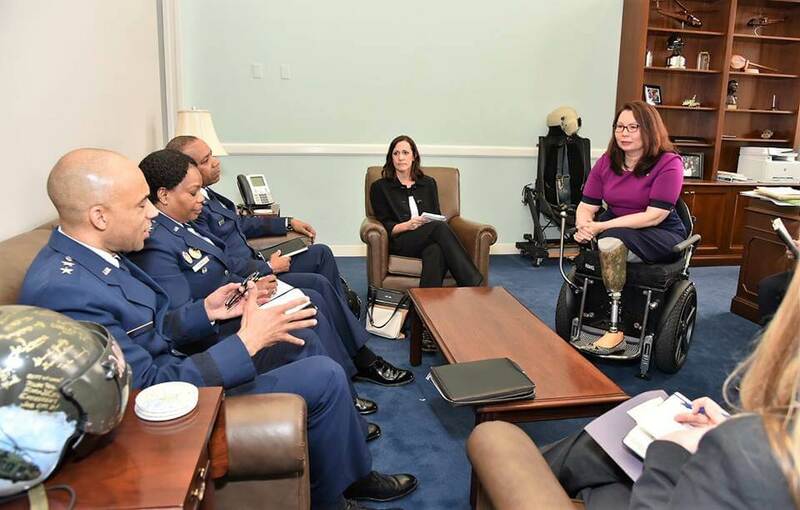 While recovering at Walter Reed Medical Center, Duckworth started getting involved in politics to support her fellow soldiers on and off the battlefield. And now she serves as a U.S. Senator focused on veterans’ affairs. Q: At College Magazine we’re working together with EMILY’s List, Emerge America, the Human Rights Campaign, Higher Heights, She Should Run, Victory Fund, Running Start and IGNITE on an initiative to fight for equal representation in Congress called “50 by 2050.” What are your thoughts on the goal of achieving 50% of women in Congress by 2050? A: It’s important, not just to me but to our entire country, that Congress—both members and staffers—look like America. Congress should have the diversity of background, of experience, and of physical ability that the rest of the country has. We are a representative body—if we don’t look like the country that we represent, then it’s hard to effectively address the concerns of all Americans. There is also a noticeable lack of women in leadership positions in the Senate. These positions are extremely important in putting family issues higher on the priority list. Q: Can you talk about your experience in the Armed Forces and Department of Veteran Affairs? How has that experience shaped your goals and experience as a senator? A: The two most important lessons the military taught me are to never leave anyone behind—not on the battlefield and not in our country—and to never put a service member in harm’s way without understanding the costs of war. You see, beginning with the rigors of training, the military instills in you a camaraderie and sense of purpose. When it was exhausting and miserable, my fellow cadets and I were exhausted and miserable together. When the instructor yelled, he wasn’t singling anyone out, but yelling at all of us, together. It took all of us working as a team to succeed. And thank God for that. I am alive today because my buddies who saved my life on the battlefield learned the same lessons. That’s why I committed my time at the Illinois Department of Veterans’ Affairs and at the federal VA, as well as my time in Congress, to making sure that Veterans have the opportunity to achieve that American dream that they defended for the rest of us. It’s also why I believe no one should be left behind, and every American deserves a second chance like I got. These two lessons inform everything I do in Congress—every minute of every day. A: I wouldn’t be a member of the Senate if not for my military experience. I got into politics while I was recovering at Walter Reed because I felt like I had a debt to repay to my buddies who saved my life and gave me a second chance at service. At the time, I felt like we weren’t doing right by our Veterans. And so I ran for Congress because I feel strongly that when the drums of war are beating in the White House or in Congress, those of us who have worn the uniform, who have been out there in the front lines, who understand the long logistical tail of any military operation, should be here to ask the tough questions when we debate issues of war and peace, and make it clear that people understand what we are talking about when we make these commitments on behalf of the American people to deploy troops overseas. Veterans should be in Congress to hold the government accountable for the promises we make to our military men and women and their families, who go out and do these incredible jobs at our behest. Q: For college women interested in pursuing a position in elected office, can you describe what a day in the life of a Senator is like? Do your mobility challenges affect your work as a senator? A: As a Senator, every day is unique. I meet with constituents I have the honor of representing, as well as introduce and advocate for legislation that would make their lives better. I’m doing my best to hold the President and Washington accountable as well as help create jobs for hard-working Illinoisans get ahead. As an American living with disabilities, my life isn’t like many of my colleagues in Congress. Getting around can be difficult. I can’t always get into restaurants or other public spaces. I have to spend a lot of time planning how to get from one place to another. I understand that not everyone thinks about these things, and for most of my adult life I didn’t either. But after I became injured in combat, I gained a greater appreciation for how important the protections of laws like the Americans with Disabilities Act and the Individuals with Disabilities Education Act (IDEA) are to ensuring millions of Americans with disabilities can live and thrive with dignity. Without them, Americans like me wouldn’t be able to get to work, go to school, hold a job, pay taxes, go shopping or do any of the things people take for granted. That’s one of the reasons I have spoken out about disability issues, especially when the Senate considered whether to confirm Betsy DeVos, Jeff Sessions and Neil Gorsuch. A Supreme Court Justice has the power to set the law of the land and determine what rights a disabled person is entitled to, the Attorney General is charged with enforcing vital protections for Americans living with disabilities and the Secretary of Education must implement IDEA to make sure all students with disabilities are provided a high quality education. It is important that all of these officials understand that these protections are not just disability rights issues, they are civil rights issues that all Americans should care about. Q: What issues do you find are the most pertinent to take on in this new administration, and how are you working to help combat those issues? A: I’ve said that I’m willing to work with the administration when it’s in the best interest of Illinoisans on things like infrastructure investments that will create good-paying jobs, but I’m disappointed that President Trump has so far been more interested in attacking people’s civil rights, cutting health benefits, increasing out of pocket costs for millions of middle-class Americans and pursuing policies that really divide our country. I will continue to stand up to the administration when they propose policies that will harm Illinois families or roll back important civil rights protections. Q: What was the most rewarding piece of legislation you helped pass? A: In Congress, I’ve focused my time on legislation that helps working families, small businesses, and Veterans. I worked across the aisle with my colleagues to introduce the Friendly Airports for Mothers (FAM) Act to ensure breastfeeding mothers have access to clean and convenient lactation rooms at airports. I introduced the Police Training and Independent Review Act to help prevent police-involved deaths and encourage independent and impartial investigations into law enforcement officials’ use of deadly force. I’m also proud to have helped prevent needless delays in critical consumer protections for military families against predatory lending and that the bipartisan Clay Hunt Suicide Prevention for American Veterans (SAV) Act I helped introduce became law and is helping improve access to mental health care for our Veterans and reduce the epidemic of Veteran suicide. Just as our Veterans remained faithful to our country on the battlefield, it is our turn as their Representatives to remain faithful to them. In the House, I led the effort to halt Congressional Republicans from delaying the implementation of a new rule that now protects military families from predatory lending techniques. I also partnered with Senator Tim Kaine to develop the Troop Talent Act, which helps Servicemembers get private credentials and licenses for the jobs they do in the Armed Forces before they leave the military so they can step right into a similar job following their service. Key provisions of the Duckworth-Kaine Troop Talent Act were signed into law through the National Defense Authorization Act of 2014. Recently, Congress passed my first bill as a Senator to support Illinois jobs by protecting infrastructure projects from needless delays. I’m proud that this bill, which passed the Senate 64 days after I was sworn in, is the fastest any current Senator has passed a piece of legislation after they were first sworn in! Q: What more do you think can be done to help veterans return to college after their service? Is there any specific legislation you’re working on or want to develop to help them? A: Making college more affordable for everyone has always been one of my top priorities, in part because it will help our Veterans transition into civilian life. Last year, I introduced the In The Red Act, which would’ve strengthened Pell Grants. Now, I’m working to pass the Community College to Career Fund Act (CC2), which would encourage local small businesses and manufacturers to partner with community colleges to develop workforce training programs. I introduced this bill after countless employers informed me that they are unable to find appropriately skilled workers to fill their vacancies. I want every student to have the opportunity to develop the right skills for good-paying jobs and life-long careers. I also know we need to do more to encourage Veterans to take advantage of the Post 9/11 GI Bill. It’s a tremendous resource for veterans leaving the military, giving them the opportunity to receive a cost-free education, as well as benefits for housing and books. This program helps Veterans transition to civilian life, but we need to do a better job of communicating to Veterans how important that opportunity is. “Since the election, I’ve seen countless women get involved in the political process for the first time, whether through calling their elected officials, attending the Women’s March, and running for office. These women are not only currently affecting debates in Congress, but also laying the groundwork for monumental changes to our political system. My advice would be, keep calling, marching and running!” said Duckworth. “In order to make our government more representative, we need more women to run for office. When women run, they win as often as male candidates. Yet, studies have shown women are not encouraged to run as often, are more likely to think they are less qualified than they truly are, and have a harder time raising money to get their campaigns off the ground,” said Duckworth. Send her a message on her website.